Interior Drainage Analysis for Scappoose Drainage District Improvement Company (OR) | WEST Consultants, Inc. The Federal Emergency Management Agency (FEMA) requires that levees functioning as a flood risk reduction system be accredited in order to qualify as offering protection from flooding under the National Flood Insurance Program. 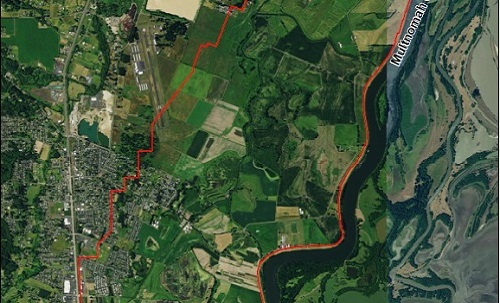 The Scappoose Drainage Improvement Company (SDIC) is in the process of accrediting its levee system. The system protects an approximate 13.5 square mile area along the Multnomah channel River. The SDIC assessment area is located in both Multnomah County and Columbia County, Oregon. SDIC contracted with WEST Consultants to conduct an interior drainage analysis, which is required as part of the accreditation process to identify flooding sources and 1% annual chance exceedance flood (base flood) water surface elevations in areas with depths greater than one foot. The assessment area has an extremely low gradient. However, several watercourses exist within the SDIC assessment area. Many of the watercourses are interconnected, resulting in a complex drainage system. Numerous gravel pits are located near the northern end of the area. To evaluate conditions of potential flooding and map areas of expected inundation for the base flood event a combined hydrologic and hydraulic FLO-2D model was developed. HEC-HMS and HEC-RAS models were also used to model inflows to the SDIC assessment area.